Each name on this list represents a grave human tragedy. Each name represents a betrayal of trust and a violation of the innocent. The sexual abuse of children and youth by Catholic priests contradicts our church’s teaching on authentic love, the beauty of human sexuality and the dignity of the human person. What was done to victims by those who were called to be spiritual fathers is cause for great shame. On behalf of the church, I apologize to each victim and pledge our commitment to do all that we can to assist with your healing. After the McCarrick scandal and the Pennsylvania grand jury report, I had hoped to be able to share earlier this information with you. However, it was not a simple task. The Church has a responsibility to be transparent about sexual misconduct with children or minors by those with leadership responsibilities in the Church. I have an obligation to protect all those entrusted to my pastoral care, especially children. At the same time, I have a solemn responsibility also to protect the good names of our priests, the vast majority of whom serve with selfless dedication, from having their reputations harmed by sometimes sincere but nevertheless unsubstantiated accusations. When you are attempting to discern the truth of an event that allegedly happened decades ago, this can be very difficult especially when the accused is deceased and the memories of others, who could have provided helpful information, have faded. The list that we are providing today is accurate based on the information we possess at this moment. There are some allegations in our files that need additional investigation. I did not wish to delay further the publication of this list until we could complete a more thorough investigation of every historic allegation of abuse and give our Independent Review Board (IRB) sufficient time to deliberate and make a recommendation to me. Therefore, I have chosen not to include on this list individuals with an accusation of abuse that we are unable to substantiate at this time. An accusation is considered substantiated obviously if the accused has admitted to it. If the accused denied the allegation, it can also be substantiated for instance if there is corroborating evidence in the file, knowledgeable testimony of others, and/or multiple accusations. I thank all the victims who have courageously come forward with allegations in order to prevent someone else from being victimized as well as to assist with the progress of their own healing process. I also am grateful to members of the secular press that have brought accusations to light and compelled the Church to address this evil in order to promote the healing of victims and protect our children and youth today and in the future. I renew my expressions of gratitude to Jan Saylor, our Report Investigator, for her diligence in helping us to the best of our ability to ascertain the truth. I thank all those who assist with the implementation of our safe environment programs that are designed to do everything possible to prevent future abuse. Thanks to their efforts our parishes, schools and ministries provide exceptionally well for the safety of our youth and children. I am also grateful to Linda Slater- Trimble, our Victim Assistance Coordinator, for helping our Church better care for and assist victims. I want to do all that we can to do our very best to help with the healing of those who have been victimized by representatives of the Church. I continue to offer Mass weekly for the healing of all victims of sexual abuse, but in particular those harmed by Catholic clergy. I am willing and eager to meet with any victim if it is helpful for their healing as well as to learn from their experience. Jesus tells us in the Gospel that the Truth will set us free. This is particularly applicable to the scourge of sexual abuse within the Church. It is only by facing honestly the hard reality of the uniquely devastating impact of sexual abuse perpetrated by clergy that we will continue to be motivated sufficiently to be ever vigilant in protecting our children and youth as well as to be determined to do everything possible to eradicate this grave evil from the Church. The Church is so much healthier today because of the reforms instituted in 2002 with the adoption of the “Charter for the Protection of Children and Young People.” The Pennsylvania grand jury report, if read carefully, confirms the effectiveness of the charter and its implementation. I am keenly aware that failure to be diligent and transparent in responding to misconduct by clergy jeopardizes every other aspect of the Church’s ministry. We must remain vigilant for the protection of our children and youth, for the health, happiness and holiness of our clergy and for the ongoing purification and renewal of the Church. Throughout 2019, I ask you to join me in praying the rosary seeking Our Blessed Mother’s intercession for the healing of victims, for perseverance in our vigilance to protect children and youth, for zeal in ending the scourge of sexual abuse within the Church and finally for wisdom for me and all bishops in our efforts to lead the Church with integrity, transparency and boldness during this time of purification and renewal. As a pioneer of St. Ann’s School, a member of the first kindergarten class in autumn of 1949, and a graduate in 1958, in the first class to go from K-8, I have seen many changes, social, political, environmental and, yes, even religious. It sometimes feels as though nothing is the same as in my early years. There are, however, some things that haven’t changed, such as the love of parents for their children and the desire to give children the best start possible. For the Archdiocese of Kansas City, Kansas, to deny children the advantage of being educated in their schools because of fear or contempt or judgement of the parents is misguided. As much as the Archbishop and the pastor may believe that they are protecting their flock from exposure to the gay lifestyle, in fact, they are missing an opportunity and promoting bigotry and ignorance. Nothing done in this little corner of the world is going to stop the progression of society to accept this reality. Prepare your parishioners in the halls of your own school. Open your hearts. The gates of heaven open wide for all God’s children. After this article appeared in the Kansas City Star, a person wrote and opinion that there are more recent Priest that are accused. I really did get mad so I wanted you to know that I wrote back my opinion to this. In response to the opinion “Come clean now” it seems to say that every priest is guilty. Your comment “Surely there are other accusations that are more current”. Why name a Priest who has been accused but not found guilty. The paper does not report that information. Once a priest is accused his name will be dragged thru the mud and if found not creditable nothing is done to right the wrong that has been made to their name and the Catholic Church. This has happened many times. If you want to research abuse by religious officials, take a look at the other denominations sometime rather than just Catholics. The Kansas City Star said they will post this. We will see. I commend you for your forward thinking and acting on this entire topic. I believe your flock senses the very real care and concern that you have on this issue, I do at least. There is one very nagging concern that I would be surprised hasn’t crossed anyone’s minds. 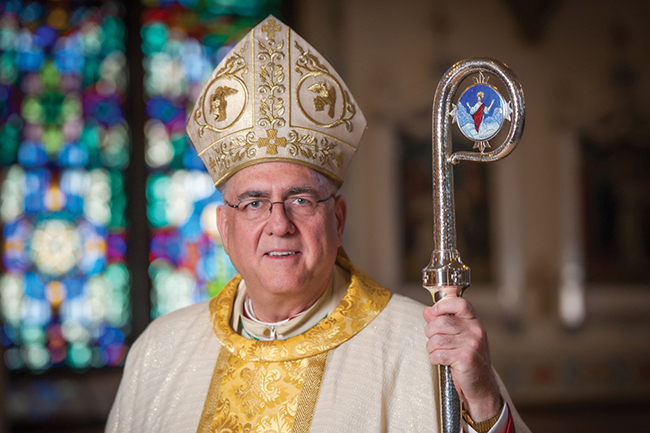 According to the article by Mr. Bollig (http://theleaven.org/archdiocese-releases-list-of-substantiated-claims-of-clergy-sexual-abuse-with-a-minor/), we see the majority of the abuse occurring during the leadership of Archbishop Strecker. I also couldn’t help but notice the numerous parishes that the priests with substantiated allegations tended to. It may serve you well to show how leadership was broken then and how it works now. I know what that graphic is trying to convey but it does not provide a clear understanding of how your leadership style is different from your predecessors… because we know that all of this improvement is not simply because of Virtus training. Thank you for your time. I continue to pray for you, our priests and our church.